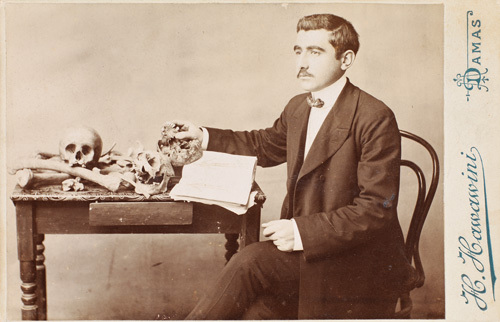 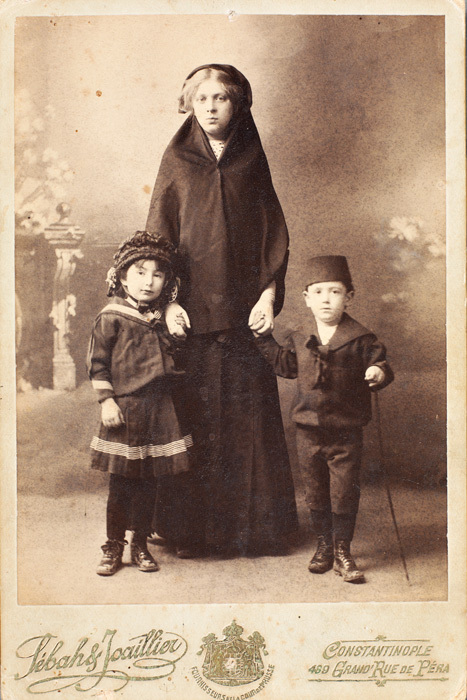 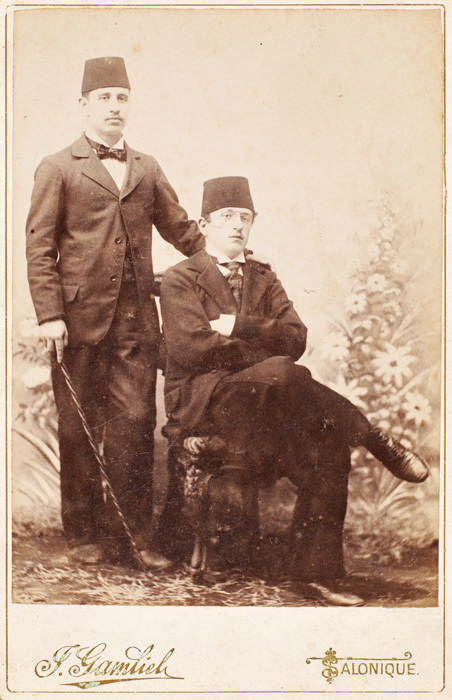 The first professional studio in Istanbul was opened in 1845 by Carlo and Giovanni Naya, two brothers of Italian origin. 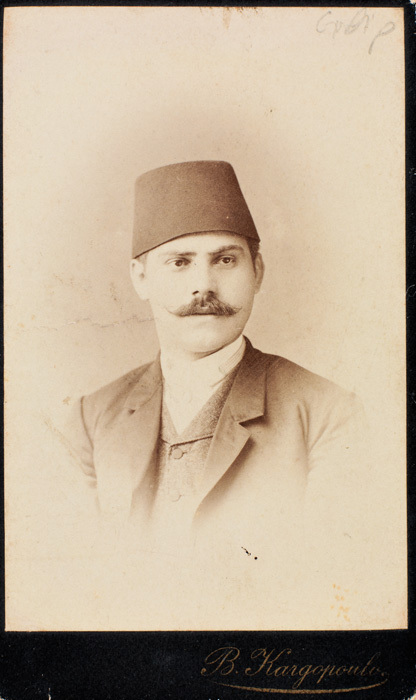 They were followed by other foreigners who settled in Pera and specialized in portrait photography. 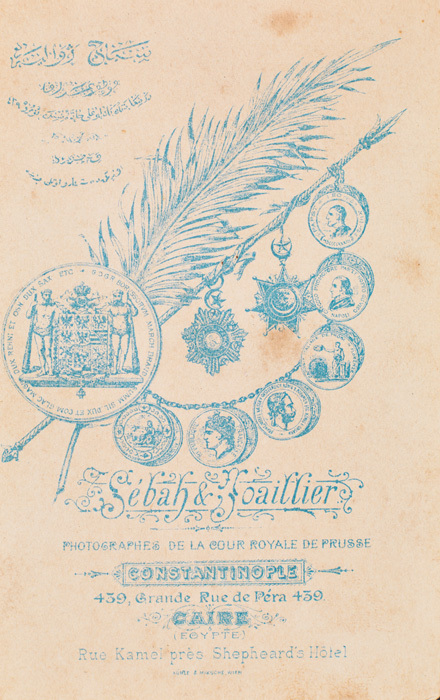 Prominent among them were the German Abresche, the Italian Maggi, the French Astras and de Caranza, and the British Robertson. 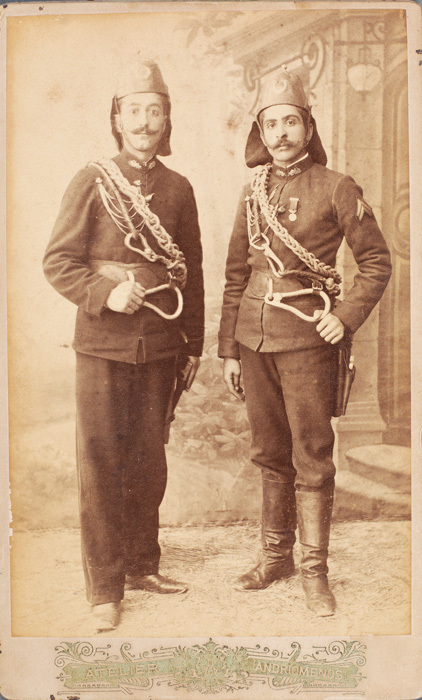 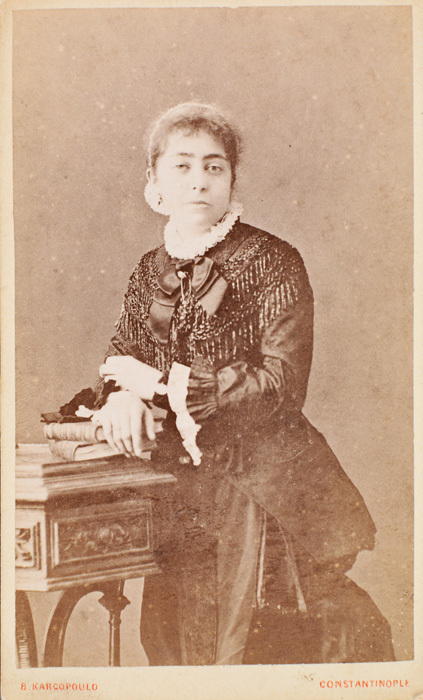 The last two photographed the Crimean War in the mid-1850s and played an important role in the history of Ottoman photography by presenting their work at the Paris and London World Expositions. 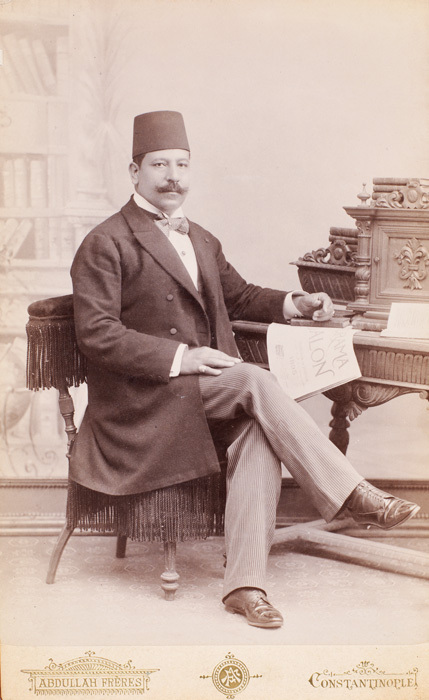 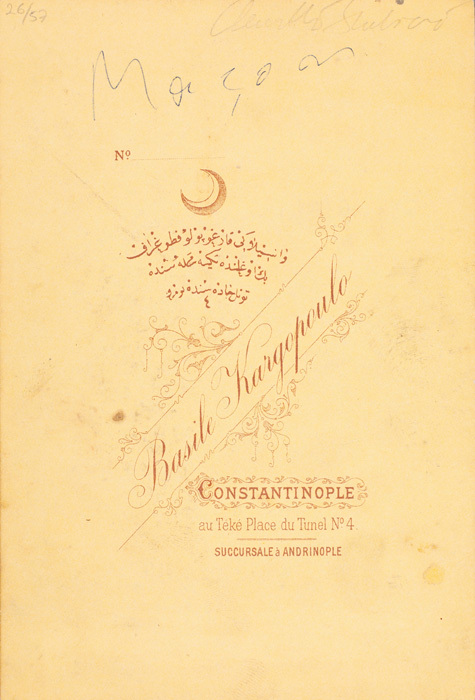 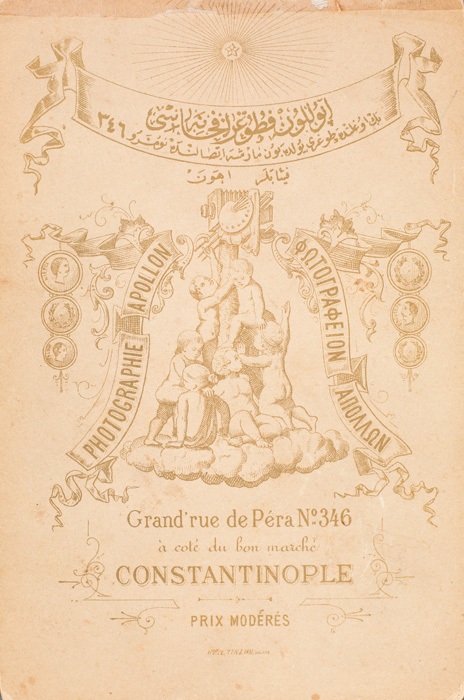 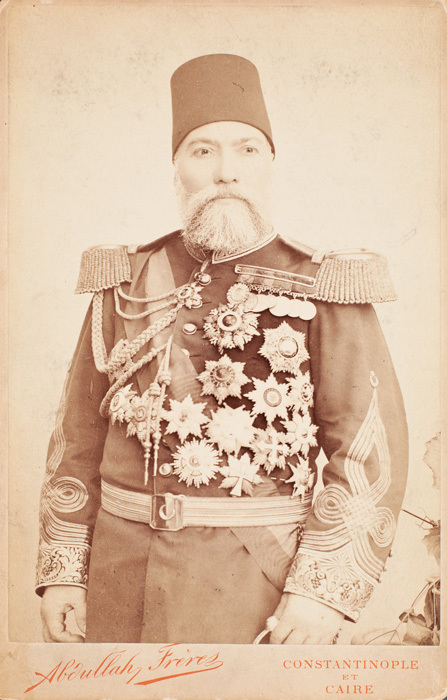 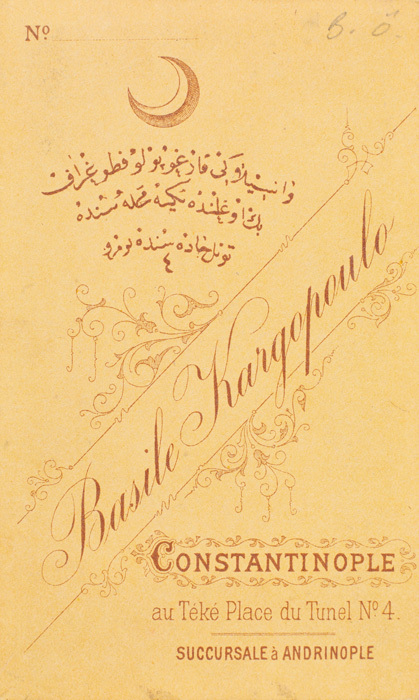 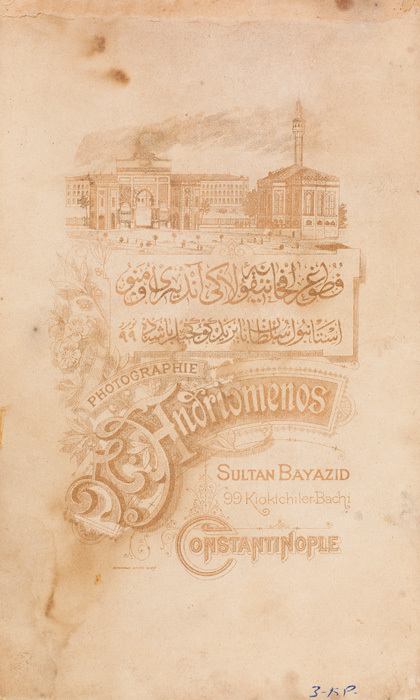 The first Ottoman subjects to open studios in the capital were Vasilaki Kargopoulo in 1850, Pascal Sébah in 1857, and Viçen (Vincent) Abdullah in 1858. 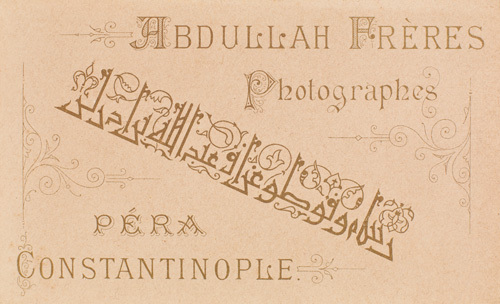 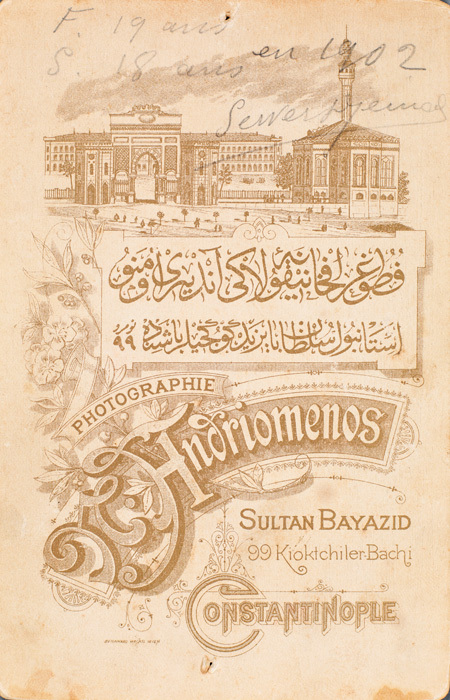 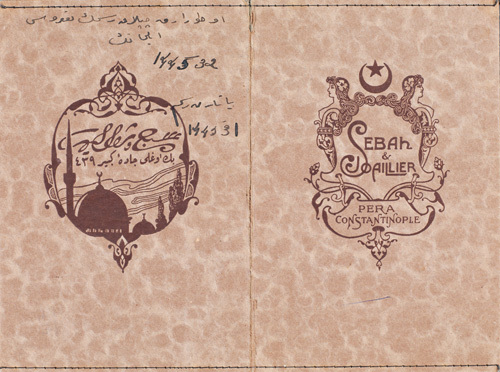 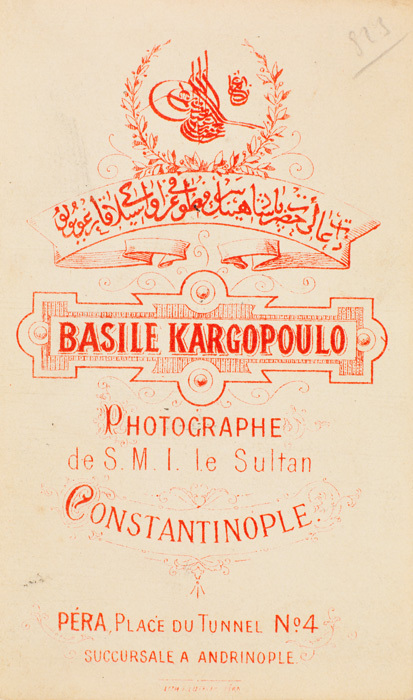 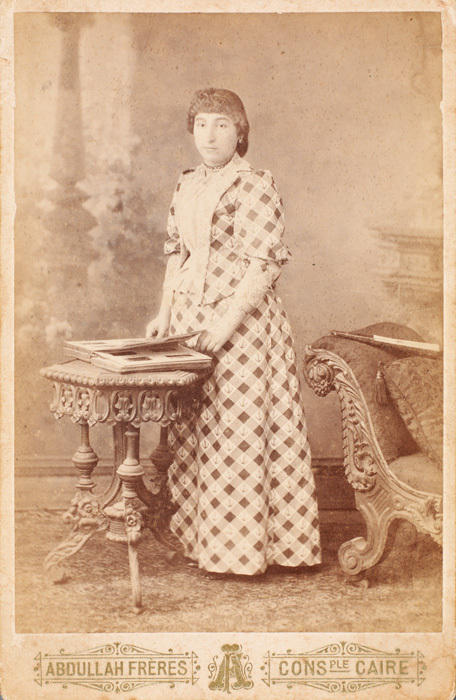 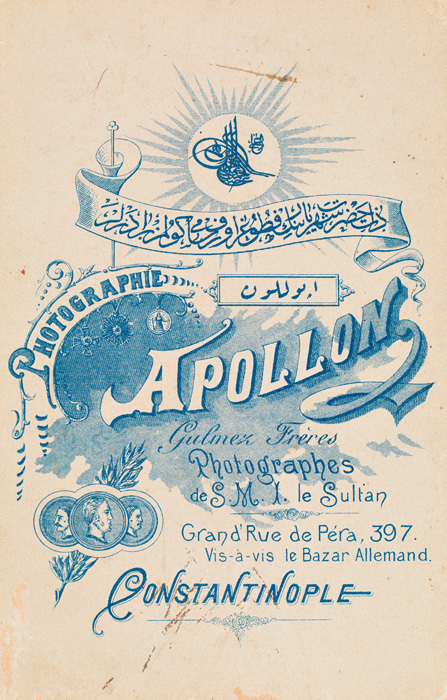 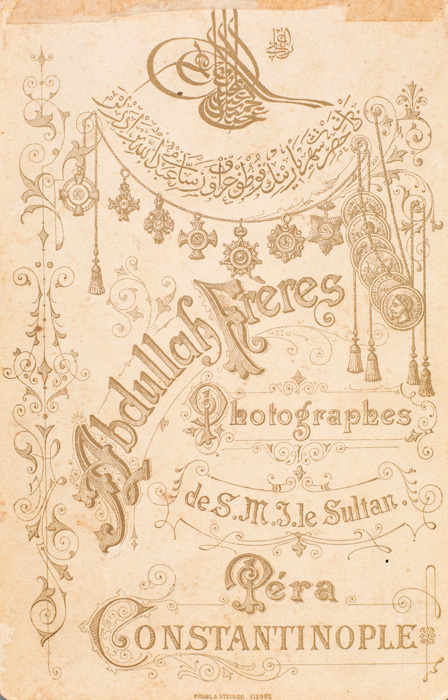 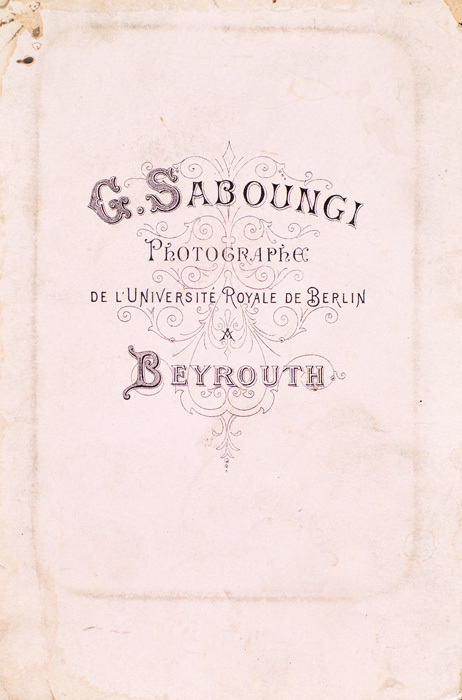 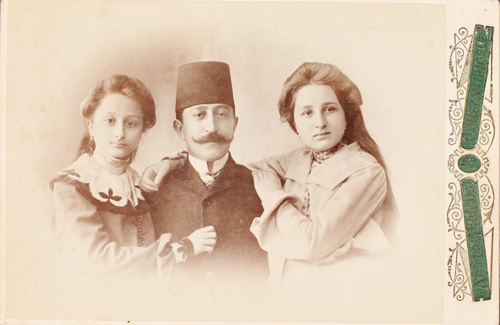 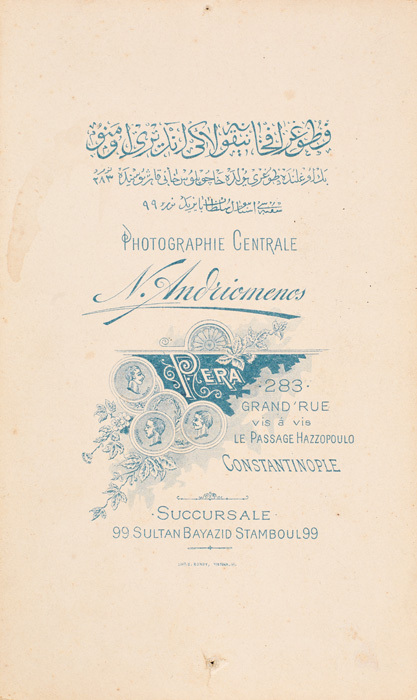 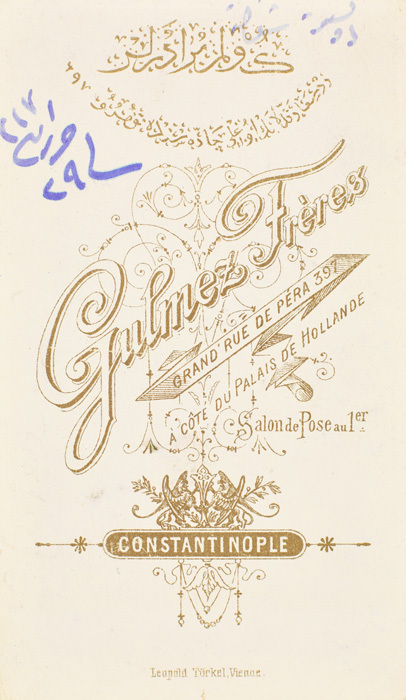 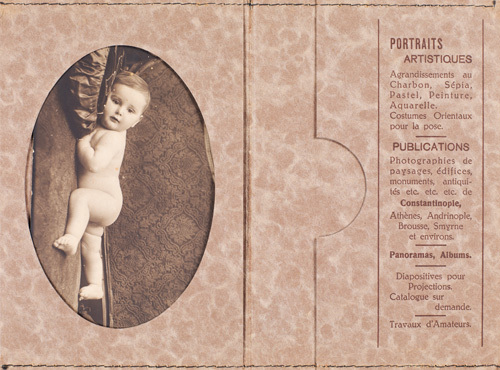 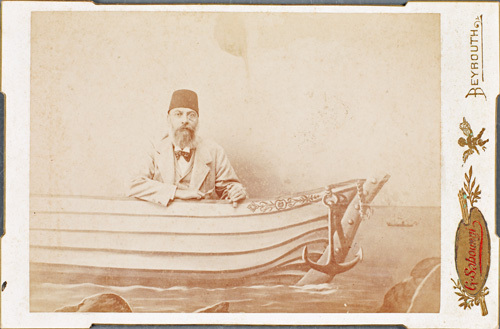 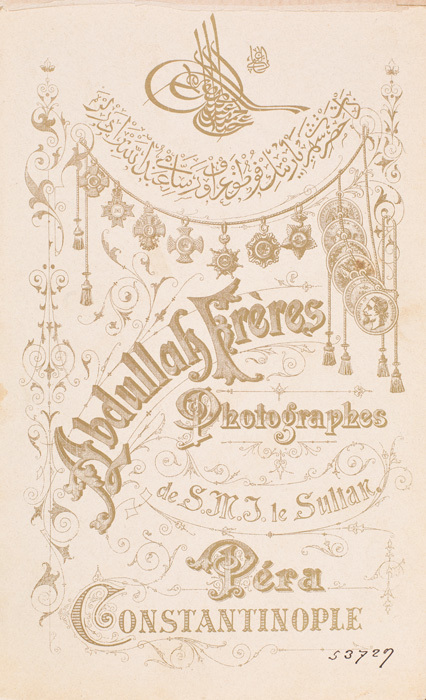 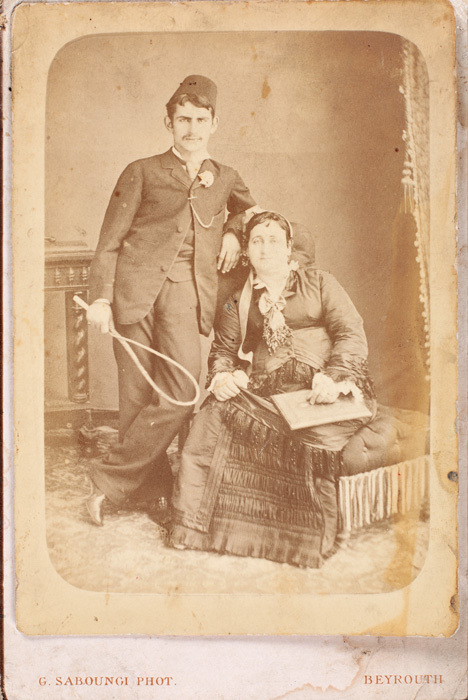 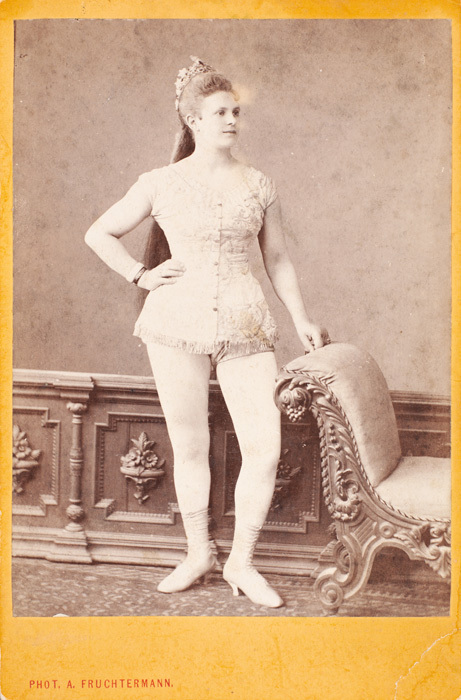 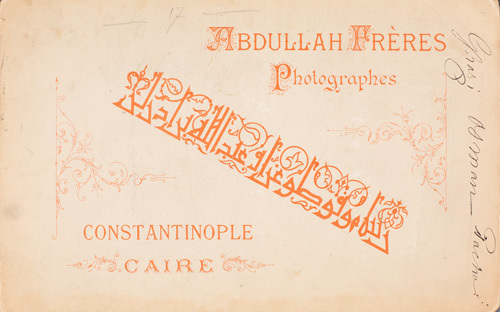 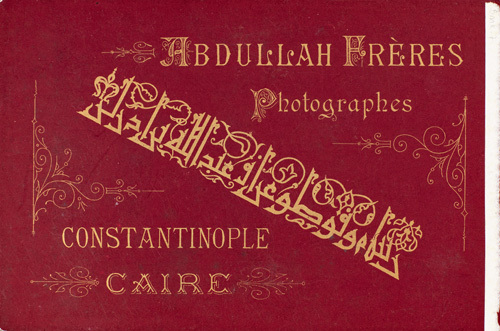 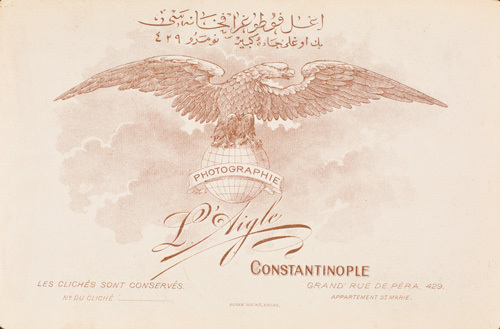 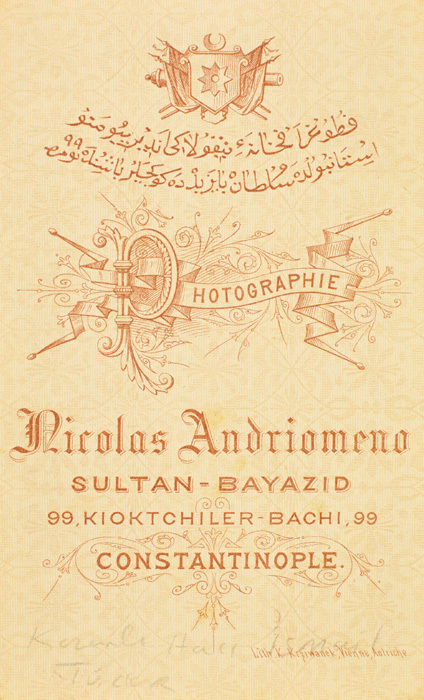 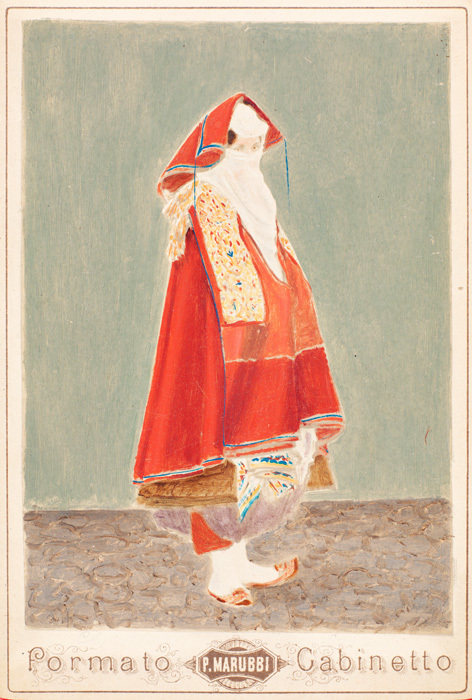 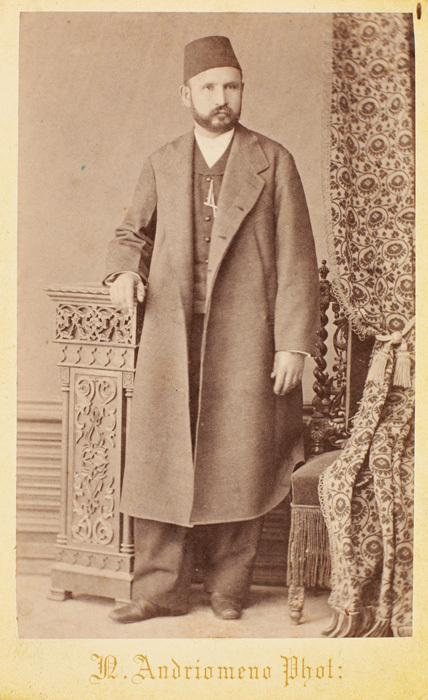 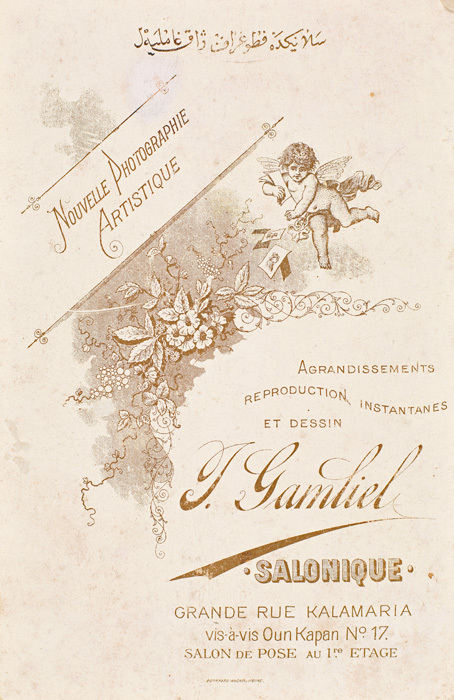 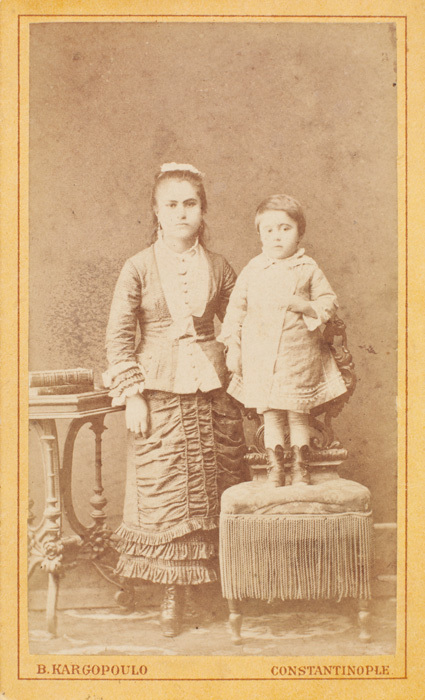 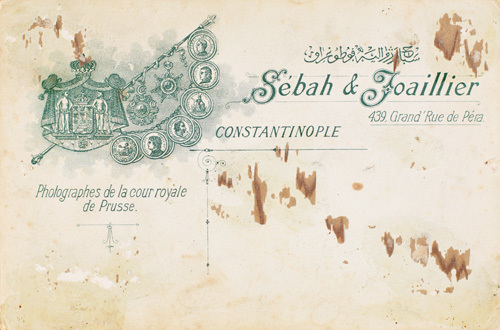 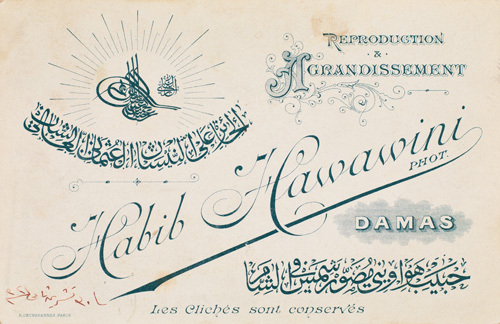 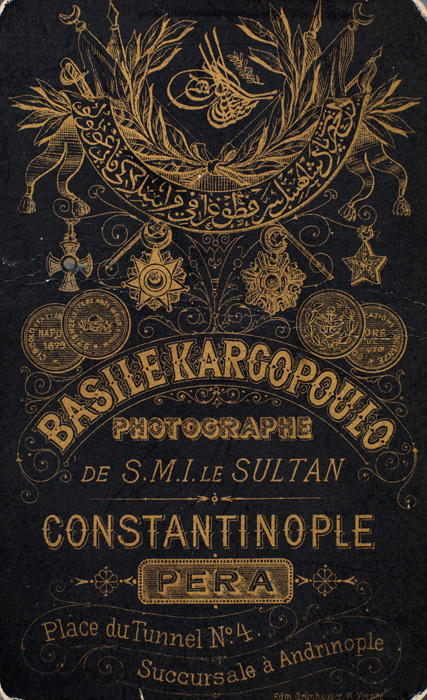 From the 1860s on, as the studios multiplied, the spectrum widened to include landscapes, monuments, scenes of everyday life, and local “types.” Intricate and decorative designs on the back of studio cards are witness to the diverse and colorful nature of the bygone world of photography in the Ottoman capital. 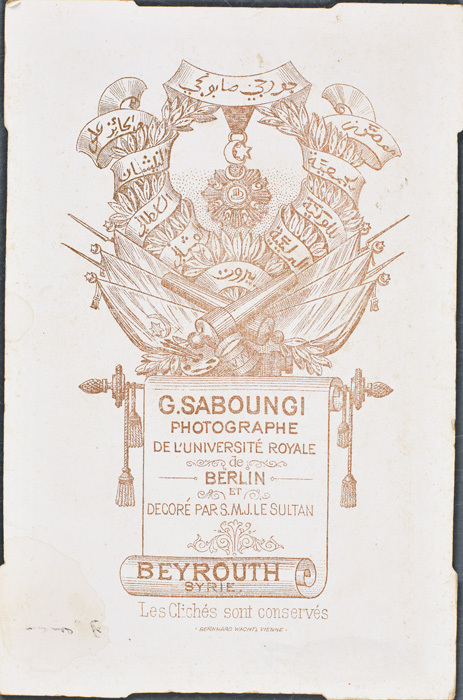 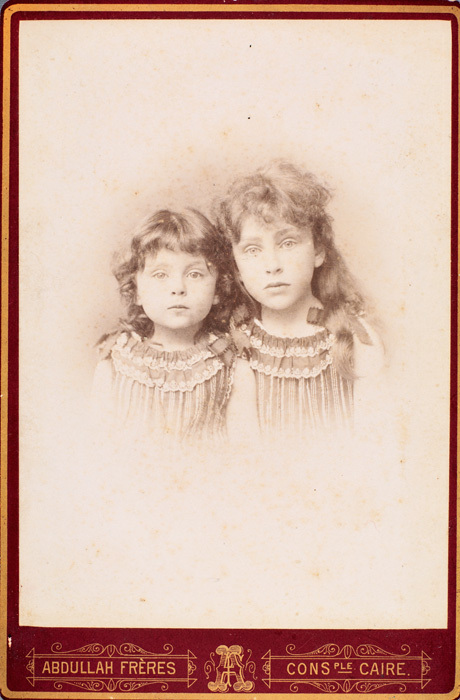 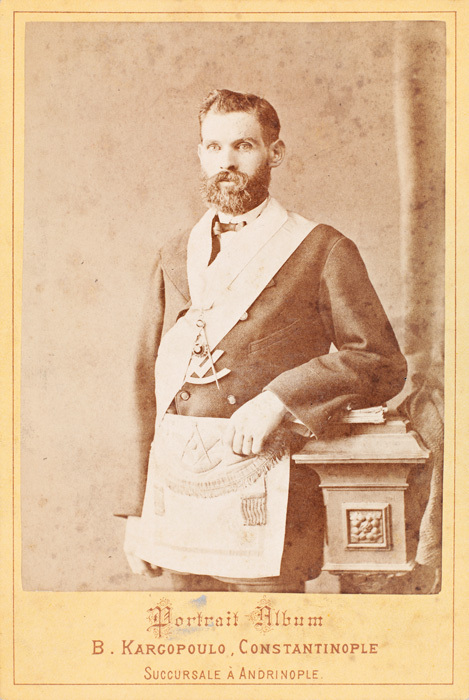 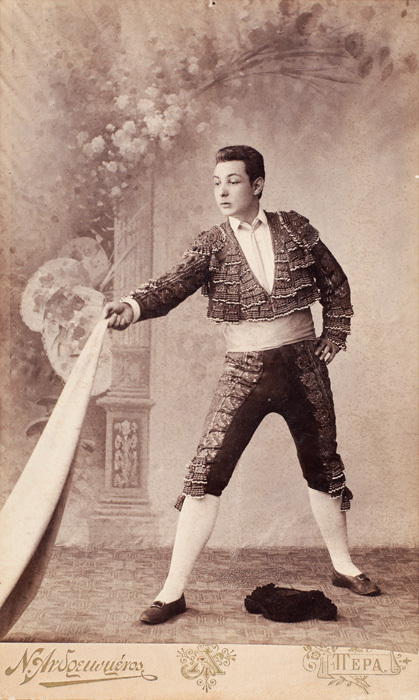 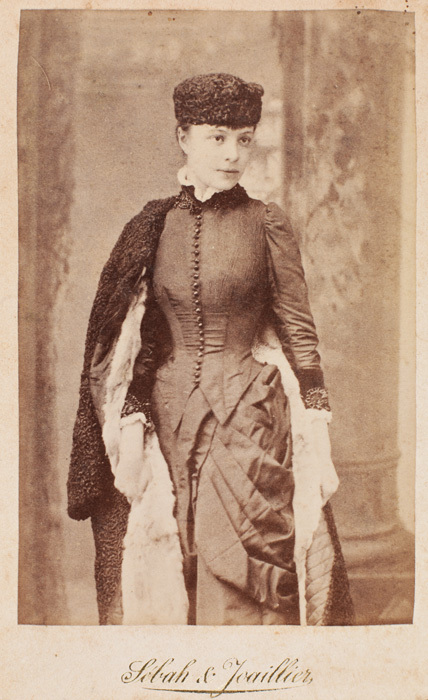 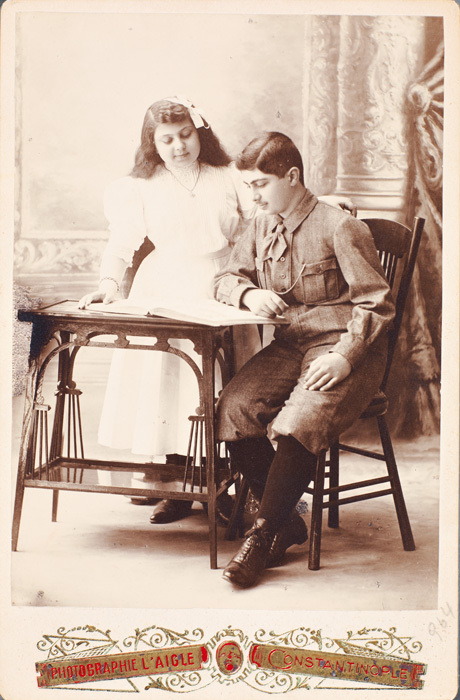 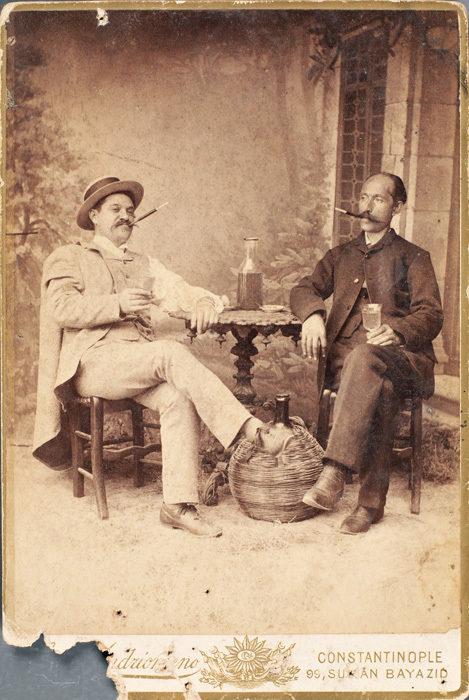 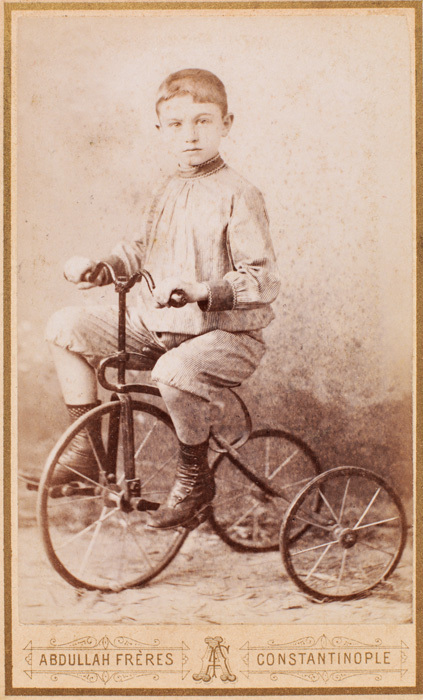 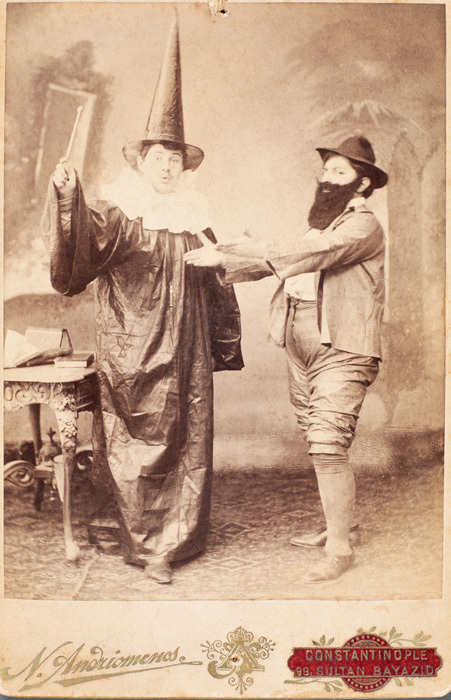 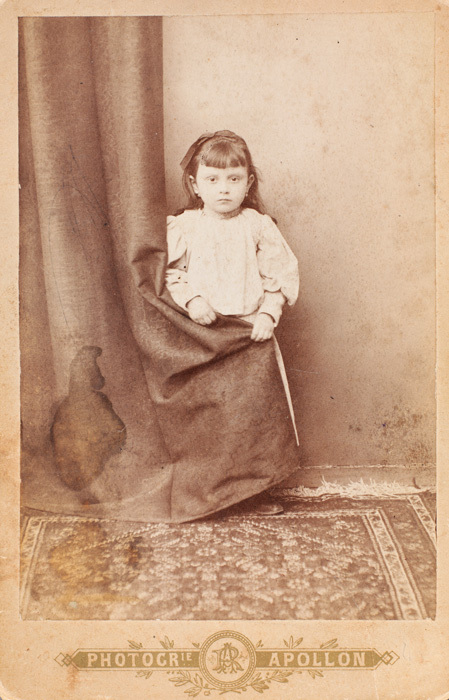 From the 1880s on, studio photography increasingly spread to locations outside the imperial capital. 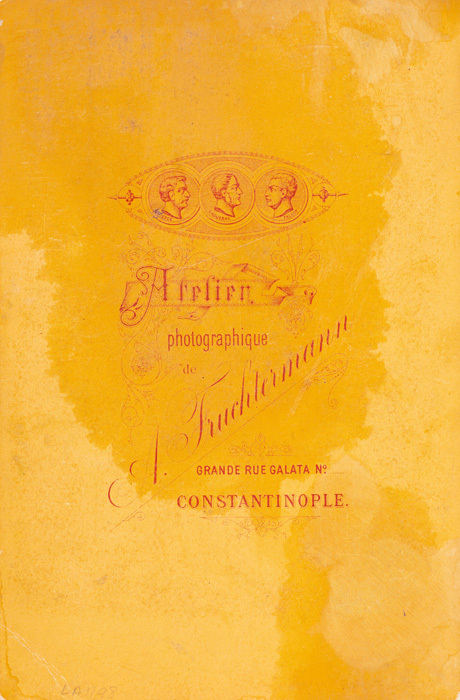 Almost all of the studios established in the Balkans, Anatolia, Syria, Palestine, and Iraq were run by Armenian or Greek photographers. 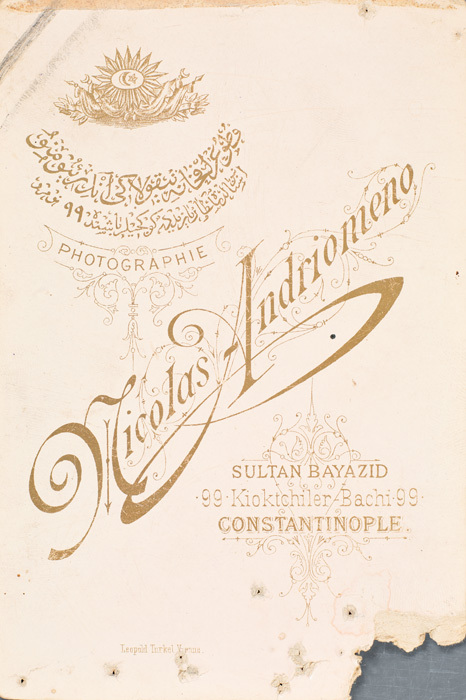 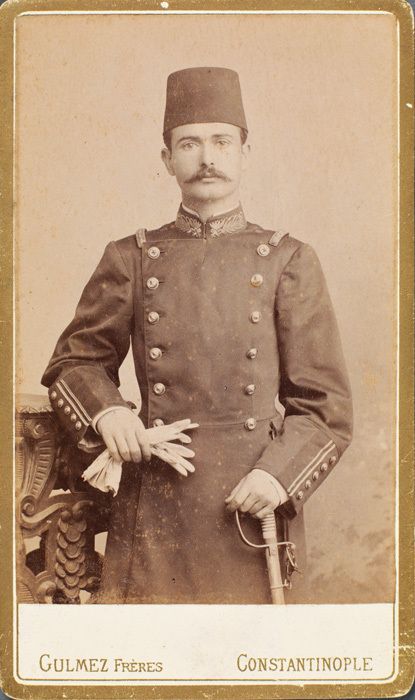 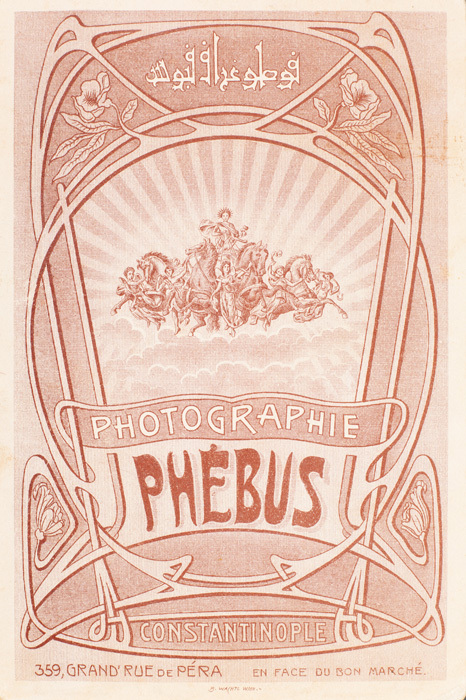 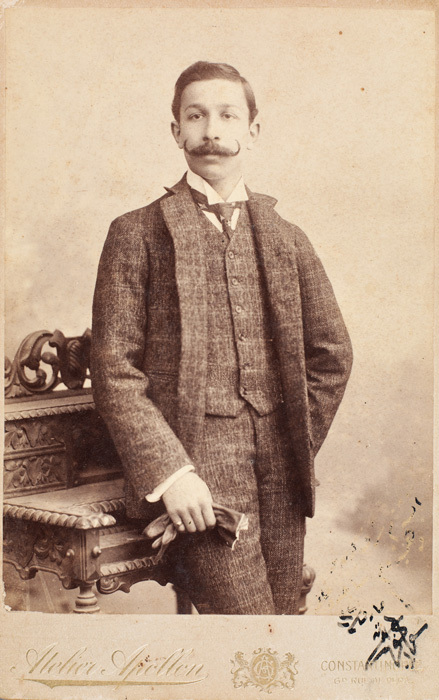 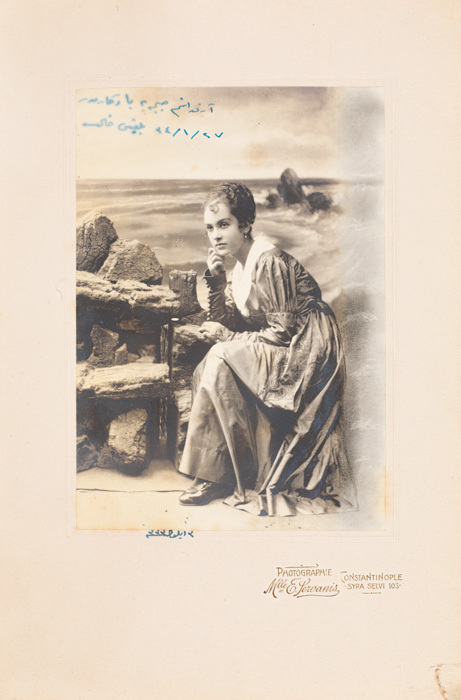 Among the prominent names of studio photographers throughout the Empire were: Rubellin and Krabow in Izmir; Emanuel Foscolo and Dimitri Michailidis in Edirne; Konstantin Kargopoulo in Aydın; Garabed Solakian in Konya; Kakoulis Brothers in Trabzon; Dildilian Brothers in Merzifon; Paul Zepdji, Gamliel, and Baubin in Salonica (Thessaloniki); Manaki Brothers in Monastir (Bitola); Pietro Marubbi in Scutari (Shkodër); Derounian Brothers in Aleppo; Felix Bonfils, Tancrède Dumas, and Georges Saboungi in Beirut; Habib Hawawini and Suleiman Hakim in Damascus; Garabed Kirkorian and Yesayi Garabedian in Jerusalem; and Donatosian Brothers in Baghdad.